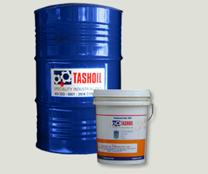 Speciality Oil G - 25 (Grinding Oil) :: Tashoil Company Pvt. Ltd.
GRINDING OIL G – 25 are special purpose non – staining type neat cutting oil. These oils are specially developed from highly refined low viscous mineral base oil & a performance enhancing additives for a flute grinding operation. Because of low viscosity, the oil will deeply penetrate inside & gives better flushing of grinding dust / chips. The special additive creates a thin film between the metal parts which reduces the friction & withstand the EP Load. Balmer Lawire -Van Leer Ltd.
Tashkent Oil Company Pvt. Ltd. Copyright © 2010, Tashoil Company Pvt. Ltd. All rights reserved.